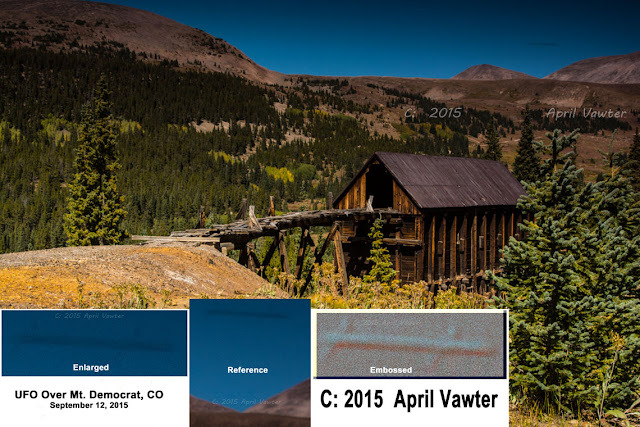 UFO SIGHTINGS DAILY: Cigar UFO Over Mt Democrate, Colorado On Sept 12, 2015, Photos, UFO Sighting News. Cigar UFO Over Mt Democrate, Colorado On Sept 12, 2015, Photos, UFO Sighting News. This rod UFO is much more clear in the HD raw photo the guy has, but we only have access to the reduced quality photo here. Rods travel extremely fast, often to fast for the human eye to notice. This rod looks about 100 meters long and 5 meters wide. Amazingly large one. I was photographing old mines and Fall foliage between Leadville and Mt. Democrat on a clear afternoon (9-12-15). The object appeared in one in a short series of photos taken at the site of an abandoned mine dump and mill. It was between 5 and 10 mile from me and from the perspective of the photo, I would estimate its length at several football fields. 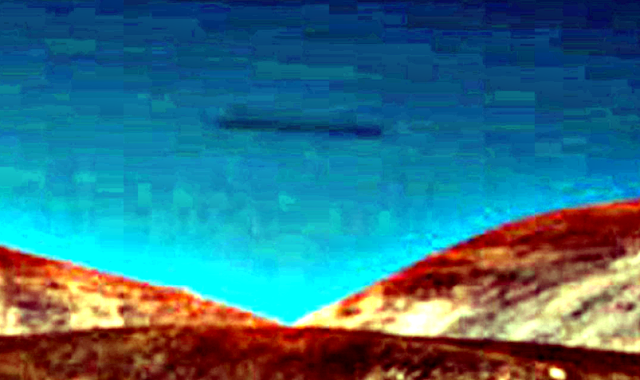 The object may have been cloaked to the human eye. It the actual image it is barely visible. The camera was a Nikon D7200, the newest model in the series, which, because it eliminates the high-pass filter, may pick up more of the infra-red spectrum. Looking at the photo, and object, it almost appears cloaked. When the object is subjected to the Photoshop "Emboss" filter, its shape is readily apparent as a cylinder or cigar with four uniform rounded appendages...two near each end. The embossed image gives strong detail in terms of shape and configuration. I didn't "feel" anything at the time, although, with other sightings I have had, I felt calm and reassured by their presence...never threatened. There are photos taken within 15-20 seconds of this photo which show nothing in the area. The original photo is a RAW (NEF) image 20.5 X 13" @ 300DPI. Enclosed is a far smaller JPEG.